Greece has missed the IMF and ECB payments this week with both non-payments having potential for triggering a mother of all defaults for Greece: the ESM/EFSF loans call-in (EUR145bn worth of debt). "The Board of Directors of the European Financial Stability Facility (EFSF) decided today to opt for a Reservation of Rights on EFSF loans to Greece, after the non-payment of Greece to the International Monetary Fund (IMF). Following the IMF Managing Director's notification of the IMF Executive Board, this non-payment results in an Event of Default by Greece, according to EFSF financial agreements with Greece." 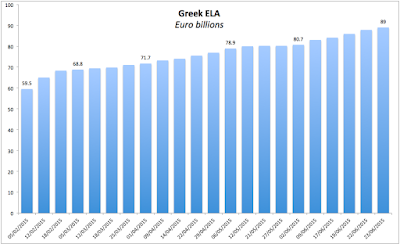 Greece owes the EFSF EUR109.1bn in "Master Financial Assistance Facility Agreement" loans, plus EUR5.5bn in "Bond Interest Facility Agreement" loans and EUR30bn more in "Private Sector Involvement Facility Agreement" loans. For now, EFSF decided not to call in loans, preferring to wait for Sunday vote outcome. Per EFSF statement: "In line with a recommendation by the EFSF's CEO Klaus Regling, the EFSF Board of Directors decided not to request immediate repayment of its loans nor to waive its right to action – the other two possible options. By issuing a Reservation of Rights, the EFSF keeps all its options open as a creditor as events in Greece evolve. The situation will be continuously monitored and the EFSF will consider its position regularly." A 'No' vote in the Sunday referendum can change that overnight. This adds pressure on Greece to pass a 'Yes' vote - a pressure that is most publicly crystallised in the form of ECB refusal to lift ELA to Greek banks. 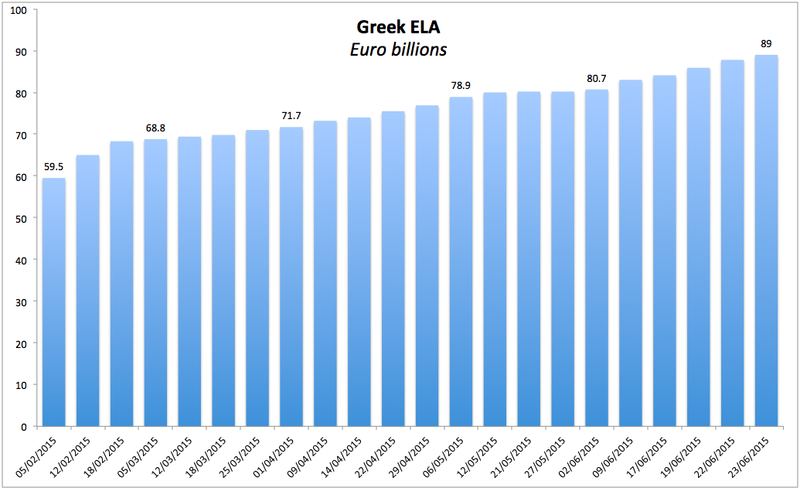 Athens imposition of capital controls (limiting severely cash withdrawals from the banks) has meant that the current level of ELA (CHART below) is still sufficient to hold the bank run, but the ELA cushion remaining in Greek banks was estimated at EUR500mln at the start of this week. Even with capital controls in place, this would have dwindled to around EUR250-300mln by the week end. 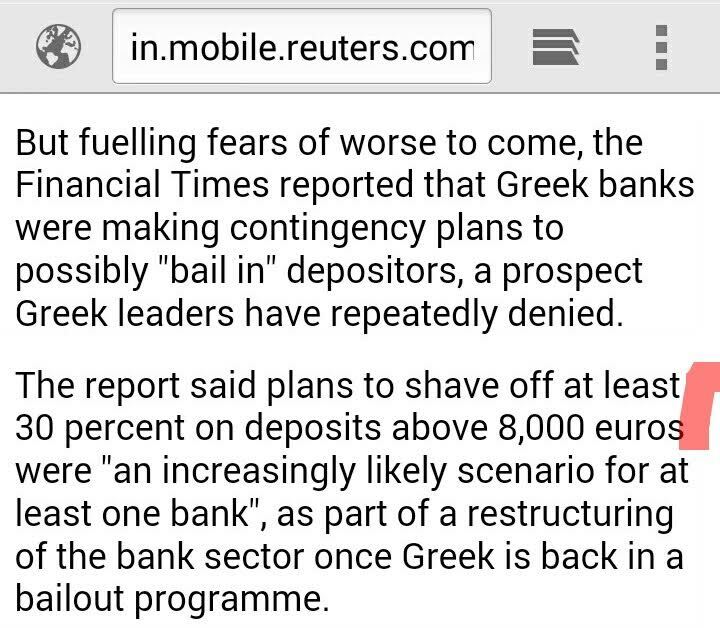 Again, a 'No' vote in the referendum risks crashing Greek banks as ECB will be unlikely to lift ELA any more. In an indirect sign of this, the ECB appears to be setting up swap lines and euro credit lines for EU member states outside the euro area. For example, as reported by Bloomberg, "European Central Bank is set to extend a backstop facility to Bulgaria and is ready to assist other nations in the region to ward off contagion from Greece, according to people familiar with the situation". 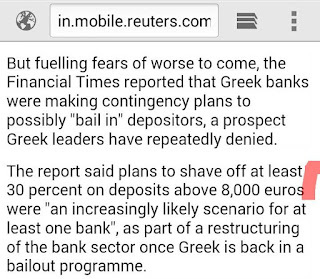 Such a move is a clear precautionary measure to put into place firewalls around Greek system. 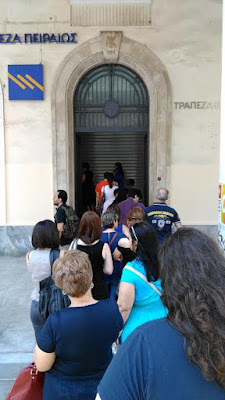 The Government denied the reports of preparations of bail-ins, and continues to insist that the banks will reopen on Tuesday, a day after the referendum results are published, but it is hard to imagine how this can be done (unless the banks start trading in drachma) without ECB hiking ELA, and it is even harder to imagine how ECB can hike ELA in current conditions. So far, public opinion polls in Greece show very tight vote for Sunday. The latest GPO poll has the "Yes" vote at 44.1% and "No" at 43.7%. Alco poll puts the “Yes” figure at 41.7% against 41.1% for “No”. All together, four opinion polls published yesterday put the 'Yes' vote marginally ahead, another poll fifth put the 'No' camp 0.5 percent in front. All polls results were well within the margin of error. At the same time, majority of polls also show Greeks favouring remaining in the euro by a roughly 75 percent margin. The build up of tension ahead of the Sunday poll has been immense. Even international bodies are being convulsed by the potential for a 'No' vote. So much so, that, as reported by a number of media outlets, there was a major cat fight between European members of the IMF and other IMF board members. As reported by Reuters at Wednesday board meeting of the IMF, European members of the board attempted to block IMF from publishing its analysis of debt sustainability for Greece. Quoting from the report: ""It wasn't an easy decision," an IMF source involved in the debate over publication said. "We are not living in an ivory tower here. But the EU has to understand that not everything can be decided based on their own imperatives." The board had considered all arguments, including the risk that the document would be politicized, but the prevailing view was that all the evidence and figures should be laid out transparently before the referendum. "Facts are stubborn. 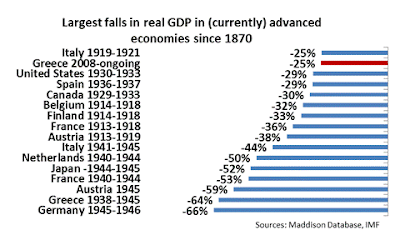 You can't hide the facts because they may be exploited," the IMF source said." If only European members of the IMF Board were as concerned with the reality of the Greek crisis on the ground as they are concerned with the appearances and public disclosures of that reality. As numbers tell, Greece has posted one of the worst collapses in economy for any advanced economy since 1870, fourth worst for periods outside WW1 and WW2. In the event of a 'Yes' we are likely to see a significant bounce in the markets from the current levels, with euro strengthening on the news in the short run. But real re-pricing will only take place when there is more clarity on post-referendum bailout agreement. The key risk to that outlook is that a 'Yes' vote can trigger early elections - which will (1) extend the current mess for at least another 1-2 months, and (2) put new sources of uncertainty forward - as outcome of such elections will be highly unpredictable. I do not expect the EU to re-start new deal negotiations until after the elections, which means that there will be mounting, not abating pressures on the Greek voters to vote in 'the right' Government, acceptable to the Troika. In the event of a 'No' we are likely to see serious run on the markets in Greece and some 'peripheral' states, especially Italy. Greek capital controls will have to be stepped up significantly. Euro is likely to weaken in the short run, especially if ECB aggressively moves to monetise risks via both accelerated QE purchases and lending to non-euro banks. Beyond these two possible scenarios, everything else is in the realm of wild speculation.